I have scaldy brows. There. I said it. Not that I had to say it because one look at them would show you exactly that. And so I've been making it my mission to try out all the brow products on the market because I'm good like that you know. 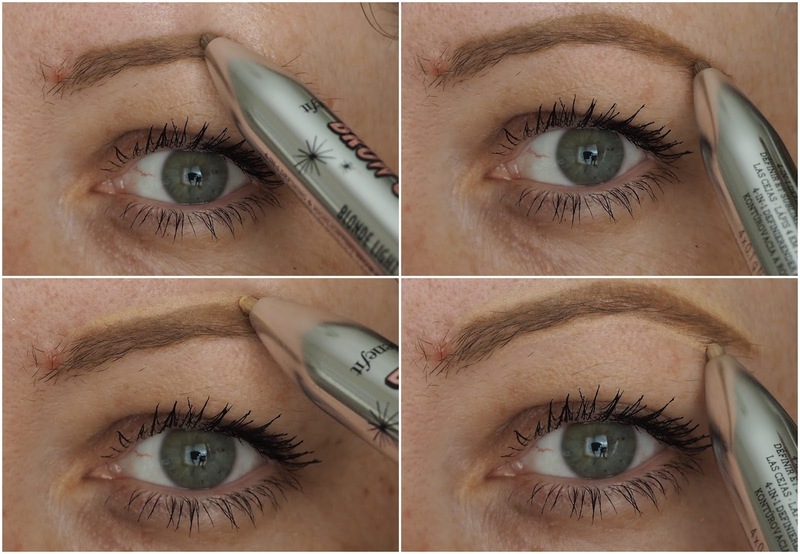 The latest offering from Benefit, The Brow Contour Pro, launched recently and I've been getting to grips with it! Ps I've a demo video at the bottom of this post, so have a read and then have a watch! First of all, the packaging is fierce retro. Ok it's retro if you're a bridie of a certain age, shurrup yew. It has four tabs that you press down one by one allowing you to define, contour and highlight your brows. After pressing down a tab, you twist the top half of the tube to release some product. Don't release too much or it'll be all over the shop and you won't have as much control. In terms of the formula, this definitely feels more like a cream than a pencil to me and when I first swatched it, I thought it was going to be hard to work with, just because I'm a micro pencil lover through and through. 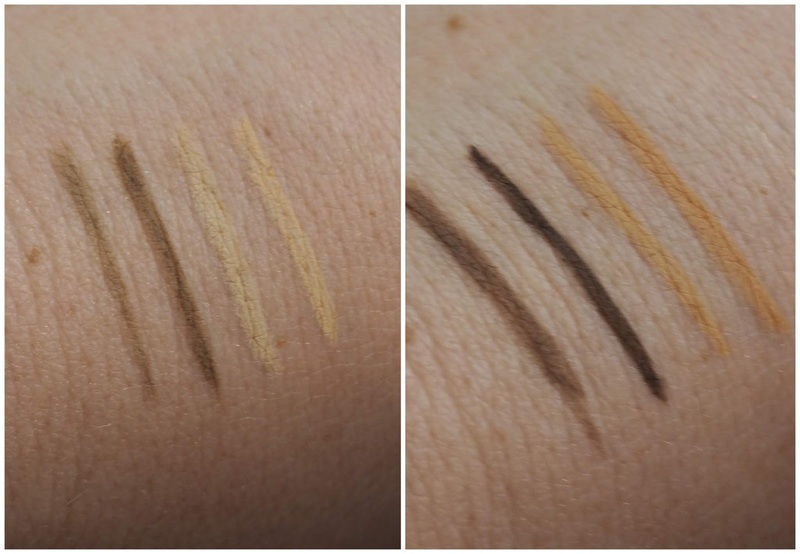 The swatches below show Blonde Light on the left and Brown Medium on the right and you can see that what they've done is match the brow shades with skin tones shades. I'd love to swatch the rest of the pencils to see if all skin colours and hair colours are being accommodated. I've been using the Blonde Light pencil as I'm a taupe brow lover. The idea is that you use the lighter shade from the inner part of the brow to the arch, then the deeper shade goes from the arch to the outer tip of the brow. 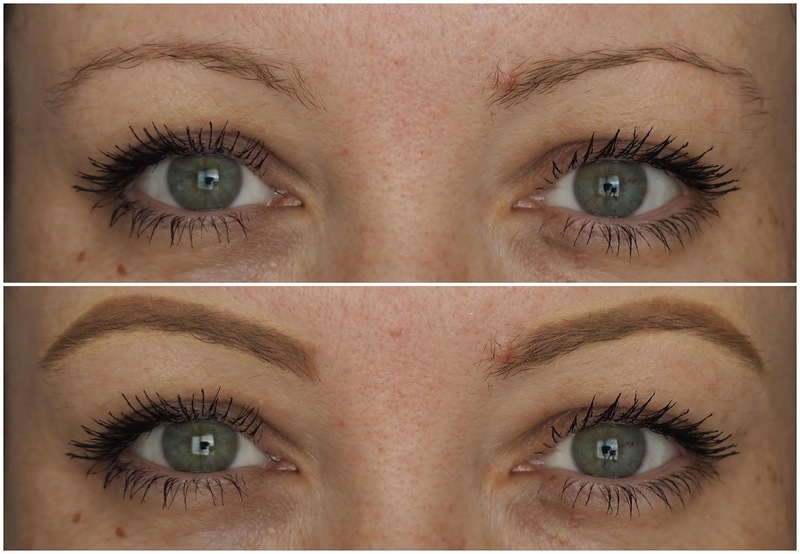 The definer shade goes above and below the brow before using the highlighter under the arch. It took me a few uses to get used to not having a spoolie at the end of the pencil, but I'm grand now. In the before and after photo below, I'm not wearing any foundation so the outline of the definer shade is more obvious. There's an accompanying Brow Blender that has a spoolie on one end and a sponge on the other end to blend the definer and highlighter shades out properly. Below shows the brows done and dusted, everything blended out and me wearing foundation. My brows stay in place all day and it's mad, I've been able to achieve really defined brows with this, more defined than my usual brow pencils which I wasn't expecting at all to be honest. I'll let you know how long it lasts and at least the two brow shades are similar enough that I'll be able to get away with wearing one over the whole brow if the other is used up quicker. The Brow Contour Pro is €35 and is on counters now. Are you tempted? !